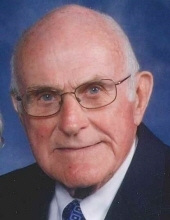 John Cunningham, 88, of Normal, passed away at 2:44 a.m. Wednesday, January 30, 2019 at his home. His funeral will be at 11 a.m. Saturday, February 2, 2019 at St. Patrick Church of Merna, Bloomington, with Rev. Dustin Schultz and Monsignor Gerald T. Ward concelebrating. Burial will be in Holy Cross Cemetery, Merna, at a later date. Visitation will be from 9-11 a.m. Saturday, February 2, 2019 at St. Patrick Church of Merna. In lieu of flowers, memorials may be made to OSF Hospice, St. Patrick Church of Merna, Towanda District Library or Central Catholic High School. He was born October 12, 1930 in Bloomington, a son of Michael T. and Abbie Duga Cunningham. He married Paula Daly on January 14, 1953 at Holy Trinity Church, Bloomington and they recently celebrated their 66th anniversary. Surviving are his wife, Paula, of Normal; four daughters, Trish Cunningham of Springfield, Therese Cunningham of Greencastle, IN, Mary (Tom) Luttrell of Charlotte, NC and Lucy (Andy) Mardis of Bloomington; and four grandchildren, John Luttrell, Maggie Luttrell, Abbie (Mark) Fieder and Mary Mardis. He was preceded in death by two brothers, Thomas and Ralph Cunningham; and a sister, Rosemary Cunningham in infancy. John graduated from Trinity High School in 1949 and served in the United States Air Force. A lifelong farmer at heart and in practice, John spent his career in the field of agriculture, retiring from Myers, Inc. in Towanda in 1990 and from State Farm Insurance Companies in 2003. John also served as Towanda Township Supervisor for 20 years. He was a member of St. Patrick Church of Merna and the Knights of Columbus and was a volunteer at OSF HealthCare St. Joseph Medical Center. John founded the Cornbelt Two-Cylinder Club, whose members shared a love of restoring John Deere tractors. He cherished any time he was able to spend with his family. "Email Address" would like to share the life celebration of John W. Cunningham. Click on the "link" to go to share a favorite memory or leave a condolence message for the family.